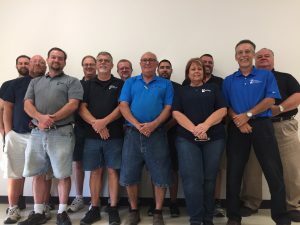 Kenneth graduated from IVY Tech Community College in 1987 with Honors and an associate’s degree in Heating, Air Conditioning and Refrigeration Technology. He has HVAC Associate’s degree, EPA certification and is Nate certified in Core, Heap Pump, Air Conditioning, and Gas Furnace. He is Ducane DSR certified, DOT certified, Lift truck certified, and TracPipe certified. Kenneth worked for a contractor while going to Ivy Tech at nights. He hung duct work and worked with the installation crews for one year, moved into the service department and ran service for two years and then moved into the sales department and worked there for another year. He has been on the distribution side of HVAC for the last 22 years. His favorite hobby is working with his hands and doing projects around the house, as well as spending time with his parents.